When thinking about a psychopath, many people assume that there must be a “type” of person who can be distinguished via their appearance or by a certain style. Possibly a crazed animal stained in blood and mad eyes would seem to fit the title of a person who loved to kill. Psychopaths live along side us and are indistinguishable from anyone else as not all of them kill people in there lives. Many have risen into positions of power in order to temper their need to rule and control others. Films usually demonstrate the psychopath's life as a crazed beast living in a frenzy and usually fail to portray accurately the manipulative side to there nature. Lacking in compassion, empathy and most of all conscience, their minds are ruled by wants and the pure desire for power and control. For example, psychopaths are twenty to twenty-five times more likely than non-psychopaths to be in prison and four to eight times more likely to violently lash out compared to non-psychopaths. Studies have shown that they are resistant to most forms of treatment. 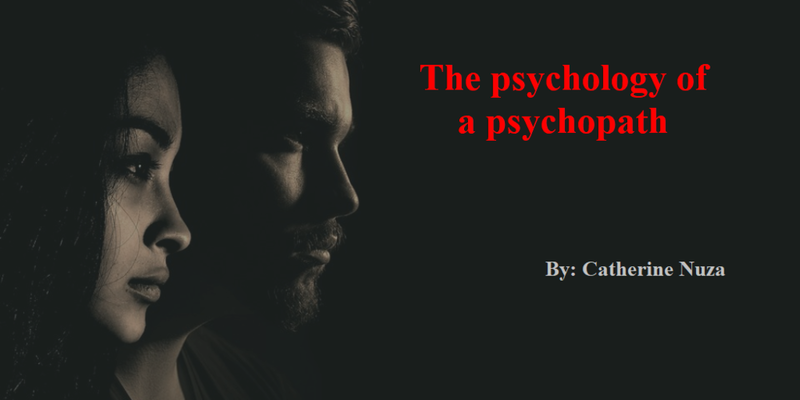 Psychopathy is a collection of psychological symptoms which typically comes out in early childhood and affects all aspects of a their life including relationships with family, friends, work, and school. The symptoms of psychopathy include shallow affect, lack of empathy, guilt and remorse, irresponsibility, impulsivity and pathological lying. It's hard to absorb the fact that there are people in this world who lack a conscience, no empathy, guilt or sympathy and can seem cruel or inhuman when you see the lack of it show up in all it's glory. Psychopaths view others as people they can take advantage of in order to get what they want or as someone in there way. So what is our fascination with psychopaths and why are there so many books and films with the psychopaths shown in all their bloody, murdering glory? Literature has eloquently interwoven these psychopathic characters into the pages of books for hundreds of years dating well back to Greek and Roman mythology even in the bible, especially in the old testament, starting with Cain. It all comes down to the question of nature versus nurture? The question if psychopaths are being created biologically or if the persons environment and experience was the true swaying factor for the birth of a psychopath? When we turn to science it states that psychopaths have reduced connections between the ventromedial prefrontal cortex, this is the part of the brain which is responsible for sentiments such as empathy and guilt, and the amygdala, which mediates fear and anxiety. There is reduced structural integrity in the white matter fibres connecting the two areas. In regards to the brain activity, a functional magnetic resonance image, would display less coordinated activity between the ventromedial prefrontal cortex and the amygdala is about 18% smaller. So nature seems to have a lot to answer for. If we look to nurture for the answer we have to look not at psychopaths but rather Sociopaths. Their brains have suffered damage, created out of abuse throughout their adolescent years and mainly due to a need to protect themselves. Abuse could have presented itself in many different forms such as: physical, emotional and verbal. Their brain doesn't form properly and instead forms a kind of wall to protect them against abuse. This inevitably results in the individual developing a very weak conscience, where in contrast, the Psychopath doesn't have one at all. Adolescence is the pivotal time for the development of the brain and symptoms can usually be seen as early as at fifteen years of age. This is due to the damage to the ventromedial frontal cortices. Adult individuals with initial normal personalities would develop defects in certain areas such as in decision making and planning that are especially revealed in an abnormal social conduct. The defect repeatedly leads to negative personal consequences. The pathology of this disorder is an enigma. I think it's down to the fact that a psychopaths mind biologically along with their way of thinking is so different and mysterious to us, that makes the subject so interesting and draws us in deeper. Even with all the scientific evidence showing the differences in our brain and function, our human nature still has an unshakeable need to try to connect with them, through our sympathy, empathy and fear. Unfortunately connecting with a psychopath would and could only be superficial and fake and most certainly had been created just so they could gain something beneficial from us.